Ever since I joined Pinterest it has me hooked both professionally and personally. I am a visual person and this way of collecting cool images and pinning them on a virtual pin board makes me very excited indeed. I also love the way it takes you through to the ‘how to’ blogs to help create that perfect wedding accessory or doing a hairstyle. Apparently I am the “typical” user of this social phenomenon. Ladies between 25-34 (OK a tad outside the mark as my husband has just pointed out! ), are listed as being the highest users of the site. In my blog post today I want to show you the many ways it is useful and what my most liked/repinned Pins are. What does it mean to Paperless Wedding? I am using it to gather images for my blog posts and research different companies. I am also using it to promote our Paperless Wedding page by pinning images of invites and the wedding websites. I have created a board to go with each of themes to help couples see what other ideas can be combined with their wedding invitation design. I love doing this and I have even got my sister hooked and she is a regular pinner on my boards. The time spent is worth it and consequently we are having lots of new visitors to our site. It is also helping me to connect with beautiful stationery designers who might want to turn their wedding stationery into a digital copy! My top boards that people like are my Wedding Ideas, Eco Wedding, Wedding Photography. These have the most likes and repins. This pin is taken from a Celebrant called Jacqui Clarke who is in Australia and who has also appeared on our blog before! So what does it mean to me personally? We bought our first house together just as Pinterest went live. 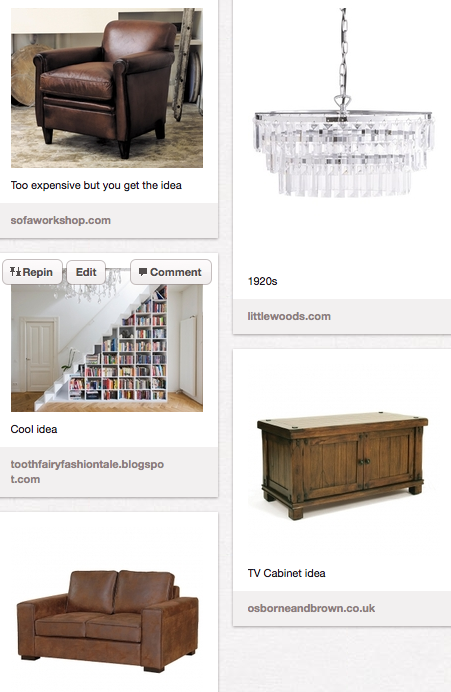 We have a board for each room and I am collecting images of my dream furniture and accessories. It is so easy to use and I can search for what I am looking for within Pintrest, as well as pin from websites. Once it is pinned other people can “repin” on their boards and also comment on your pin. This has been handy as I share ideas with my dad, who is rather clever when it comes to building and decorating things. I also love the fact that each pin links straight back to the website where the original image is kept. This then allows me to order it……if my husband lets me get hold of the credit card! You don’t have to just use Pinterest for your wedding. As I have shown I use it for all manner of things. First step is you can create a board, name it and then away you go. Ideas for boards are one for dresses, decorations, hairstyles, cakes, then slowly the list can go on and on. They even have a topic called “wedding and events” so you can peruse a visual concoction of all things weddings there. Jump onto our boards and repin and like our posts. I wish you lots of fun if you are beginning your Pinterest journey and if you an old hat, do share your favourite pins in the comments below.